We have a number of Dracula species in the school collection but this is the plant with the largest and most dramatic flowers. The species is native to dense cloud forests in Colombia and Ecuador at altitudes from 1700-2000m. 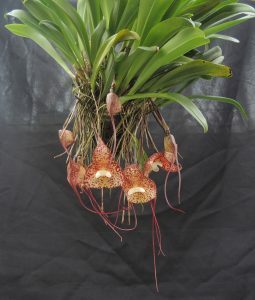 We have seen other draculas growing in Costa Rica where we found plants restricted to wet mossy positions in low light. 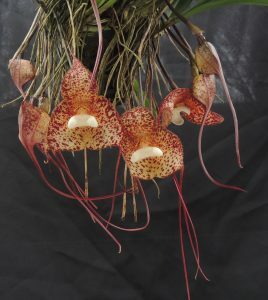 In common with most draculas, Dracula bella has strongly pendulous flower spikes and so basket culture is important, both to display plants, and to stop flowers becoming trapped in pots. It took us a while to grow draculas well at Writhlington as we struggled with the plants requirements for baskets and damp conditions. Our baskets dried out and plants responded to heat and drought stress by developing black blotches on their leaves. We initially blamed the black blotches on too much water and so grew the plants dryer – getting worse leaves as a result. Fortunately, seeing plants in the wild corrected our culture and so we now hang our draculas under other baskets in Cool Americas where they stay wet, shaded and cool and respond with great leaves and a fantastic display of flowers. Dracula bella flowers throughout the year but the current display (above) is the best we have had – perhaps it is time to split the plant? 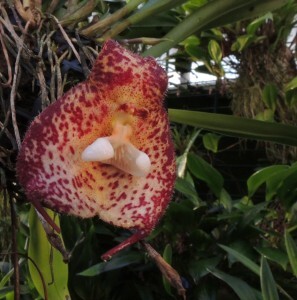 The flower is a deceit pollinator and mimics a fungus with its strange lip to attract fungus gnats.